The premises upon which the core of the Align-Ed offering is built has been inspired by “Preserve the Core and Stimulate Progress” (Built to Last – James Collins and Jerry Porras, Williams Collins. 2004) and The Experience Economy (Joseph Pine and James Gilmore, Harvard Business Review Press. 1999). We specialise in strategic thinking, as well as the development of brand and culture that is aligned with this thinking (the elements that make up the core of any organisation) for our clients. We support the creation, activation, development and sustainability of this core through various processes and products. We approach brand building and engagement as a means of creating memories for end users and customers. The purpose behind alignment is to ensure that the golden threads of the strategy, brand and culture (the core of the organisation) are pulled through in every touch point, and that each stakeholder that is involved with the organisation (including staff, management, customers and other stakeholders) perceives a connection to the core in the same manner. The alignment ensures that all stakeholders deliver authentic experiences that are aligned to the strategy, brand and what the organisation stands for. Which addresses the manner in which the organisation and brand emotionally connects with those who are a part of their business, as well as the community and the social and physical eco-systems the organisation engages with. Engagement reflects the emotional investment in the core that is authentically lived out through the brand experience. Engagement by stakeholders contributes significantly to organisation and brand performance, and business scorecards and results. Our engagements include staff, management, customers and other stakeholders. Our approach to engagement is aimed at addressing the startling statistics related to employee engagement as found by the Gallup Poll on the state of the Global workplace. Align-Ed’s African approach to storytelling and crafting experiences provide context for people to implement strategies in businesses in Africa. Oral traditions form a critical foundation of learning and teaching in African culture. We use story-telling, a right brain activity to promote and integrate business thinking and practice. Our manner of storytelling engages the hearts and minds of people involved in the business and brand. Storytelling is used for effective communication of strategic, brand and culture messages that reinforce the core of the business or organisation. As stories are a traditional way of communicating in African culture, alignment, learning and engagement is more likely to be sustained for a longer period. Traditional learning focuses on knowledge and skills needed to fulfil the tasks contained on a job description. However, such learning does not equip people to transform and adapt as part of the ever-changing business world. Align-Ed uses transformative learning to address the learning which is needed as a part of the journey of organisation evolution and change. 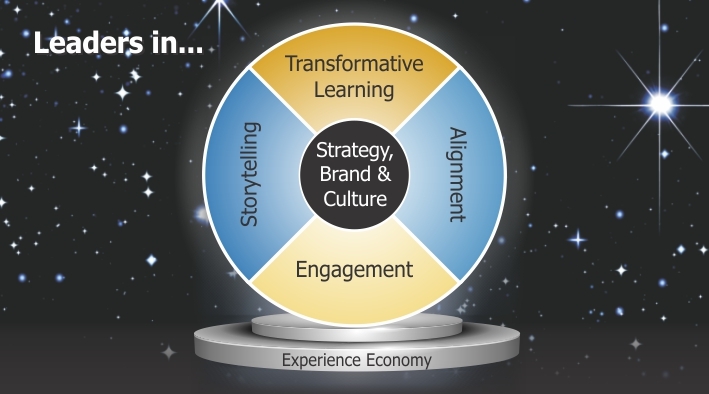 Transformative learning is the process Align-Ed uses to create the context for learning needed to operate and function in the realm of the experience economy. This type of learning – by its nature – aligns and engages people to ensure sustainability, on-going growth and organisational endurance. Transformative learning is easily adaptable across audiences and channels of learning.